Snowdonia is very well connected by public transport, road and rail from most parts of the UK. There is a good local service of buses from Llanberis to Caernarfon, Bangor, and Betws-y-Coed via Capel Curig. There is also a dedicated Sherpa shuttlebus which runs services around Snowdon, picking up and dropping off at the start of each of the main paths. Be warned that even in peak season the last Sherpa from Llanberis to Pen-y-Pass is at 1800, and the last back down to Llanberis is 1930. Outside school holidays the last up is 1630, and the last down 1745. People very often climb up one route and choose to come down another for safety or in error only to find no evening bus to get them back to their car. There are regular mainline trains from London, Midlands and the North West of England across the North Wales coast, to Bangor and then across to Anglesey, ending up in Holyhead for the ferry to Ireland. There's a branch line from Llandudno town, to Llandudno Junction and on down to Blaenau Ffestiniog. There's another branchline from Pwllheli, round the coast to Machynlleth and then inland to Shrewsbury, with another spur taking you down to Aberystwyth. They all travel through stunning countryside and you won't be disappointed by your journey. By far and away the star attraction for rail enthusiasts is the wonderful network of steam trains in the area. 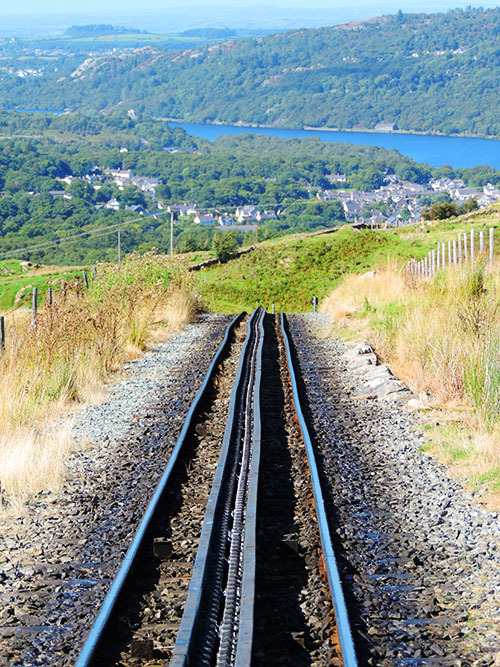 Apart from the Snowdon Mountain Railway which takes people to the top of Snowdon, there's a smaller railway - the Llyn Padarn Llanberis Lake Railway - which takes you from near the Victoria Hotel in Llanberis round to the Slate Museum and round Llyn Padarn. The Welsh Highland Railway runs from Caernarfon, down to Beddgelert - with stops for some of the paths on the western side of Snowdon - and on to Porthmadog, where you can pick up the Ffestiniog Railway which ends its journey at Blaenau Ffestiniog. With a bit of planning, you can achieve a fabulous round trip from Caernarfon to Porthmadog, up to Blaenau Ffestinion and on up my the mainline to Llandudno Junction, completing the circle by bus back to Caernarfon.